Home › Personal Development › Is Network Marketing a Pyramid Scheme? If not, what’s the difference between network marketing and a pyramid scheme? You made the right decision to do some research and be concerned, because pyramid schemes are illegal and can put you in to a lot of trouble. The good news is that network marketing or multi-level marketing is a legitimate and legal business model. On this page we will help you to identify the differences between network marketing and pyramid schemes, including a checklist of things to look for. No, of course not. If this were true every profitable company, government,and school would be illegal and shut down. It is not so much the shape of the pyramid that people should be concerned about, more the way in which the pyramid is created that distinguishes whether or not it is legal. Let’s review. A pyramid scheme can be defined as a fraudulent money-making scheme that is based on a non-sustainable business model that involves the exchange of money primarily for enrolling other people into the scheme without a legitimate product or service being delivered. Eventually the number of new recruits fails to sustain the payment structure and the scheme collapses with most people losing the money they paid in. In a more practical sense, probably the easiest way to identify pyramid schemes is firstly there is no legitimate product or service involved (ie you do not get a legitimate product in return for your initial investment). The second way to identify pyramid schemes is that you do not get a financial return unless you have successfully introduced a number of new recruits into the pyramid. Basically, pyramid schemes concentrate on the money that you could earn by recruiting new people into the pyramid and generally ignore the marketing and selling of any products or services. The concept behind network marketing is a distribution model that allows a company to sell their products directly to the consumer. Choosing to use a word of mouth approach (networking) instead of advertising through traditional streams (eg media). Therefore instead of paying the media for advertising, network marketing companies are structured to reward distributors through commission in return for selling their products and finding new customers. Therefore the main focus of a network marketing company is product distribution. In fact, in a legitimate network marketing company, distributors are not required to recruit new distributors in order to earn a commission, they can earn money purely by selling the company’s product. Although distributors can choose to sell the company’s products to earn their commissions, not everybody wants to be a sales person and therefore choose to recruit more distributors into their organisation as a means to build their referral base. Not only does this create a group of loyal customers, it also allows you to leverage the efforts of others to create a residual stream of income. Why do distributors in network marketing normally receive a commission when a new recruit joins their organisation? To join a network marketing company you have to purchase an initial start up kit. This kit usually includes training, some sales and management tools to assist you to build your business, and a certain amount of product. Because there is a certain amount of product included in the start up kit, the sponsoring distributor is now entitled to a commission. For example, when becoming associated with a network marketing company there are normally a number of different business options available, what’s the main difference between the cheap business options and the more expensive ones? The amount of product you receive in the package, that is the more you spend up front, the more product you receive as part of your initial package and the greater the commission the sponsoring distributor is now entitled to. The opposite is also true, most network marketing companies now offer a very low start up option where you do not have to purchase any product to get started, just the training and business tools. In this scenario the sponsoring distributor does not receive any commission in return for you joining their organisation, they do however now have a new distributor (and customer) who they introduced to the business and therefore any future product that is bought or sold by this new recruit is eligible for commission. In summary, when trying to understand network marketing, distributors are paid a commission – not for recruiting new members, but for the amount of product that is sold through their organisation. Therefore recruiting new members into a network marketing company is purely a way of expanding the distributor’s network and customer base. Any commission made through recruiting new members is a result of the product sold in the start up package and not for the recruiting itself. Another big distinction between pyramid schemes and network marketing is the fairness of good maths. To prevent network marketing companies from falling over like pyramid schemes (where people at the top make all the money and people at the bottom lose everything), there are restrictions placed in the network marketing company’s compensation plan that limit the number of people who can earn a commission off any given sale. Basically there are only so many ways you can split a dollar, therefore, network marketing commissions only travel so far. This not only makes the business model sustainable but also makes it fair in the sense that it doesn’t matter if you got in first or last, you have the same opportunity as everyone else. Please bear in mind that every network marketing company’s compensation plan is structured differently. To learn more about the basic structures please refer to the compensation plan chapter after finishing this page. So in summary, despite the fact that network marketing and pyramid schemes share a few similarities (i.e. 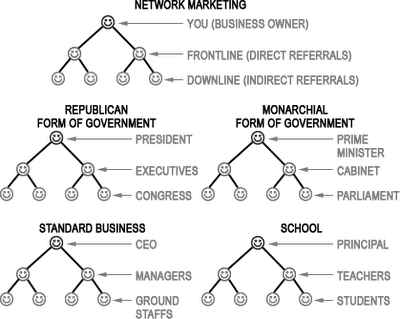 the pyramid shaped business model shown in figure 1, and that in both you can recruit new members) network marketing is a legitimate business opportunity and one where you can earn a substantial legal income. You don’t have to take our word for it, network marketing is now being endorsed by a number of leading businessmen worldwide. A word of advice when looking into a network marketing business opportunity – unfortunately some pyramid schemes have tried to mimic the network marketing business model before being discovered as fraudulent, therefore you have every right to be initially concerned. For your benefit we have put together a list of questions that you can ask yourself prior to signing the dotted line to help you identify a legitimate company from a fake one. Is there a legitimate product involved? What do you get in return for your start up investment, other then the potential to earn good money? If you’re not getting a product or service or if the training tools appear to be overpriced you could have discovered a scam. For more information about recommend products please refer to the “choosing the right product” chapter. Do you get commissions based on product distribution or on recruitment? If they are paying commissions based purely on recruitment, walk away now. Additionally, you should also consider the following factors that might influence long term success. Although some people might claim you earn more money if you get in first, this is never the case and these are companies that normally fold within the first couple of years. It is much safer to join a company with a proven track record. If the company has been around for a few years then there is a fair chance that governing bodies that police pyramid schemes have already pulled the business model apart and given them the ok. Publicly traded companies are normally your best bet. Will the company buy back any unsold product? Most network marketing companies have a money back guarantee which means that if you are unhappy with the products you can send them back for a refund. Given that the majority of your start up kit was product, if you’re not happy with the business you should be able to send back any leftover product to refund most of your start up costs. Try network marketing and potentially become very wealthy, or if it’s not working for you send your product back for a refund, it’s a win-win! Naturally a pyramid scheme is not going to refund your money. Although there is a lot of potential to earn very good money in network marketing very few have made it quick, most make their millions through consistent effort. So if it sounds to good to be true, it probably is. If you are looking into the industry for the first time don’t be scared to look at other business models and products, particularly if you don’t know which company to join. There are many discussed within this webpage. What training do they provide? A good company has a solid training system. To finish with, we strongly advise that you take the time to make your decision, don’t be pressured into joining right away, do your homework. This webpage will give you most of the information you need including background into the industry itself, what it takes to be successful and common mistakes to avoid. If this webpage has helped you in any way, we are glad to be of assistance. In the spirit of networking please feel free to recommend this webpage to others to help give the industry a good name. ‹ What Is Network Marketing? Thank you so much for really breaking it down! Pyramid schemes confused me at first as I always wondered what people meant when a corporate business has a pyramid structure but you’ve explained it so well! Thank you again.